Bags enthusiasts will be known the brand that offers this shoulder, Michael Kors. Known stylist and designer since 1981 under the brand Michael Kors Collection and MICHAEL, Michael Kors produces luxury accessories such as handbags, shoes, watches, jewelry and clothing. The products are designed for sophisticated style but easy to carry, even iconic and modern, which is recognizable and durable. 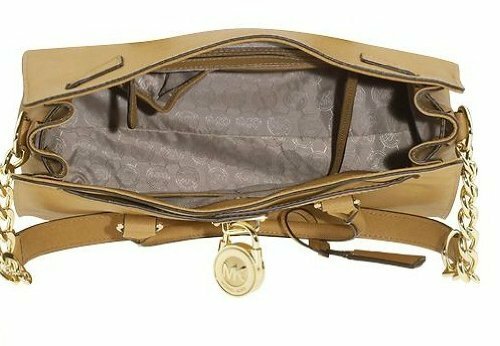 The model of this bag selected for online shopping is the Bedford Flat (MICHAEL – Michael Kors 32H2MBFC2L). It ‘made of leather in classic black and is suitable for daily use to those who love bring along essential obects and at the same time keep hands free. Straps of small / medium size as this one, can also be used with larger bags as a shopper or tablet / pc cover, to allow us have smaller and frequently used items as a phone or documents always at hand. The Bedford Flat is internally lined with plain fabric with the logo of the brand and the metal parts such as zips, buckles and logo are silver in color. The shoulder strap is adjustable with a buckle closure. The bag has two large outside pockets, one with a zip on the front and the other on the back with button closure. Here’s an object can be inserted into the Christmas whishlist. The Tote Bag Michael Kors Hamilton is becoming a classic for those who love this kind of bag. It’s made ​​of soft fine leather saffiano, has a double handle: handles to carry it by hand the shoulder strap made ​​of leather golden chain to be worn even in “crossover”. Has a functioning lock which can be closed by means of its key placed in a kind of “pocket” in the form of “tags” hanging on the bag itself, the hardware part is in golden metal and inside is equipped with a magnetic closure, with zip pockets and mobile phone pocket. This kind of bag can be used on a daily basis thanks to its versatility in the way to be worn and in the manner in which it can be combined with different “outfits” from the classic coat with an enveloping neckline and shoes with heels to more casual jeans , shoes and fabric jacket. This model is the most famous of the brand and is made of multiple versions of color like black or brown or green or such as this “malachite” that goes well, why not, in the upcoming holiday season.